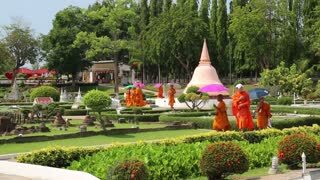 Temple Wat Phra That Lampang Luang in Thailand: Buddhist prayer cermony next to the big stupa. People are pulling the cord to raise something up to the top of the stupa. 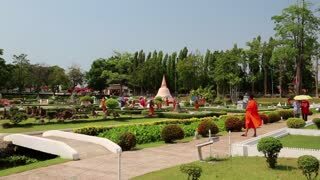 Temple Wat Phra That Lampang Luang in Thailand: the view of the wall around the temple fom outside, entrance to the temple, small park in front of the temple wall, flags. Temple Wat Phra That Lampang Luang in Thailand: sitting Buddha, black and gold, religious decorations, lotus, flowers, wisdom tree. 31th December 2018. bangkok, Thailand. Buddhists pray inside the Temple during the New Year festival. Dusk to night time lapse. Buddhists pray at a New Year ceremony in a large temple in Bangkok, Thailand..